Earlier today, numerous websites reported that Hello Kitty is not a cat. That's not only an oversimplification, it's also not quite true. 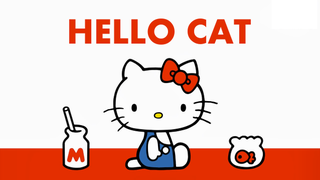 Hello Kitty is a feline—just an anthropomorphic one, Sanrio told Kotaku. I was corrected — very firmly. That's one correction Sanrio made for my script for the show. Hello Kitty is not a cat. She's a cartoon character. She is a little girl. She is a friend. But she is not a cat. She's never depicted on all fours. She walks and sits like a two-legged creature. She does have a pet cat of her own, however, and it's called Charmmy Kitty. Of course, Hello Kitty is a character that has come to represent Japanese cute, but isn't the point of personification giving animals human characteristics? I mean, do we really need to point out things like real crickets don't have top hats and umbrellas like Jiminy Cricket? One again, to clarify, I asked the Sanrio spokesperson, "Then, it would be going too far to say that Hello Kitty was not a cat?" The spokesperson replied, "Yes, that would be going too far." In short, you cannot remove the cat element from Hello Kitty. So, i t goes without saying that Hello Kitty is not a house cat like Tom from Tom and Jerry. Well, Mickey Mouse isn't a mouse like Jerry, either. He can drive a car. Over the years, he's had various jobs. He even has a pet—a dog named Pluto. But, Mickey Mouse is indeed a mouse, just like Hello Kitty is a cat. Many of the headline covering this L.A. Times article called Hello Kitty "human." Yet, Yano never says that Hello Kitty is human. She simply states that Hello Kitty is a girl. That corresponds with Hello Kitty's official profile, which says the character is a "cheerful and nice girl" (明るくて、優しい女のコ or "akarukute, yasashii onna no ko"). When speaking with Sanrio, I asked if Hello Kitty was like Snoopy, another animal character that can walk upright. Sanrio pointed out that Hello Kitty was different because Snoopy still lives in a doghouse, and Hello Kitty, well, lives in a house. But, so do The Three Little Pigs, Mr. Toad from The Wind and the Willows, and a whole array of animal characters from the popular tradition. Part of the argument that Hello Kitty was not a cat centered around her having a cat for a pet. There's a long tradition of anthropomorphic characters with animal pets. Heck, Minnie Mouse has a pet cat. Yes, a mouse has a cat for a pet. Hello suspension of disbelief! Then, there's Goofy. Disney very clearly points out that "Goofy is a dog," but he is a personification of a dog. According to Disney, "Goofy was created as a human character, as opposed to Pluto, who was a pet, so he walked upright and had a speaking voice." This is why Goofy's full name is sometimes given as "Goofus D. Dawg." Yet, even though he's also owned a dog, it would be a mistake to call him a human. He's not. In both the Disney universe and the Sanrio universe, there's a clear separation between the pet animal and the anthropomorphic animal character. Let's say, however, you are still not convinced. Well, when Hello Kitty first appeared in 1974 as a character on a coin purse, she didn't even have a name. The coin purse simply read, "Hello!" In Japan at that time, the character was known as "the white cat with no name" (名前のない白い子猫), as if the character belonged in a Spaghetti Western. Then, there's the name. It's obvious, but "Kitty" means "cat" in English, but "kitty" or "kitten" in Japanese is "koneko" (子猫 or 仔猫 or 小猫). So, what's the cat connection for Japan? Wouldn't "Kitty" simply sound like a character's name to the Japanese? Maybe, but in 2009, a Sanrio spokesperson appearing on Japanese television show Megami no Marche said that in around 1975, the character was named "Kitty" after Alice's pet cat in Through the Looking-Glass. This probably explains why Hello Kitty lives in the United Kingdom. It also helps explain why you cannot take the cat out of Hello Kitty. And as Japanese site Byoukan Sunday points out, Sanrio's website groups Hello Kitty with the cat characters. The category on this page is "neko" (ねこ) or "cat." You can see it also includes Hello Kitty's pet cat, Charmmy Kitty. Even without all this, when talking with Sanrio earlier today, I pointed out that most Japanese people would understand Hello Kitty as a cat character (Yes, I also believe anyone in any country would understand that). But nobody would mistake her for an actual cat. Just like nobody would mistake the countless characters from American cartoons as actual animals, or the numerous anthropomorphized animals from fables and folklore. That is what makes the fact this "Hello-Kitty-is-not-a-cat" notion became a story and then went viral so darn surprising. There are literally thousands of years of animal personifications. Certainly, people understand that Mickey Mouse is not a real mouse, just like they understand that Hello Kitty is not real cat. They don't need to be real. They're characters. And as their names denote, Mickey is a mouse, and Kitty is, well, a cat.